Welcome to B.D. Billinghurst Middle School. We are a 6-8 middle school in Reno, Nevada and part of Washoe County School District. We hope this site offers you a glimpse into who we are, what we do, how and why we do it. BDB is a collection of staff, administrators, parents, and community members dedicated to providing a positive learning environment that meets the unique and personal needs of the middle school child. Incoming 6th grade course registration: Late registration form will be available in May. Incoming 7th grade course registration: Late registration form will be available in May. In the event that a "Digital Snow Day" is called for our school, parents/guardians will receive a phone call and/or email from the District. Please be sure that we have your correct phone number and email address. We will also have the information posted here, on our website. Students have been working with their teachers on what to do in the event of a Digital Day. 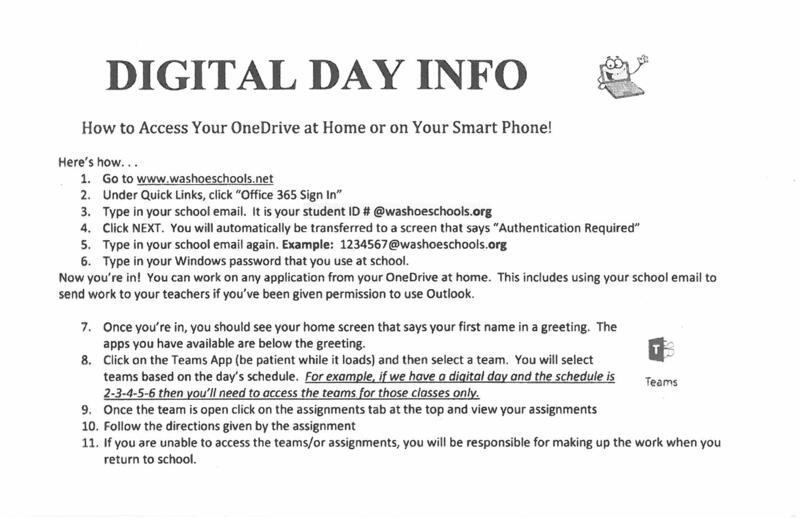 Here is the information that was sent home with all students. If you have any questions, please contact your student's counselor via email. All community volunteers listed in the guide have been screened and approved through the WCSD Volunteer Services Department.